The Monarch Pass area is experiencing what a significant portion of the southwest mountains have been seeing over the last few decades. In the early 2000’s a spruce beetle endemic occurred in the San Juan Mountains and rapidly spread to the North and Northeast as winds carried them to other mountain ranges in the State. In 2012, study plots within the Monarch Mountain ski area indicated that the spruce beetle infestation had settled in and shortly afterwards, began to affect our mature stands of Engelmann Spruce trees. The Monarch Pass Vegetation Management Project was put together by the San Isabel National Forest staff under the authority of the US Farm Bill. A portion of this Bill assists in addressing various types of infestation in crops and agricultural products. The USFS is managed under the US Department of Agriculture. 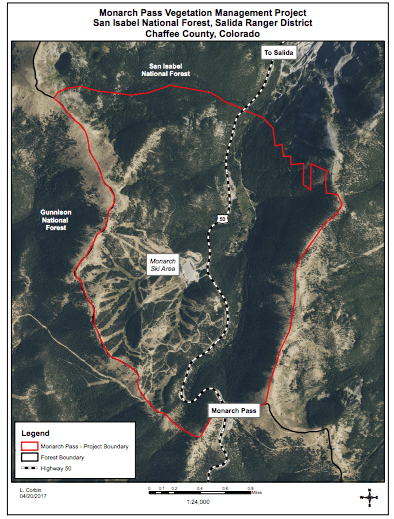 The project encompasses 2,450 acres near the crest of Monarch Pass and includes the Monarch Mountain Ski Area. The predominant tree species in this area is Engelmann spruce, with a lesser component of subalpine fir and lodgepole pine and minor amounts of aspen and Douglas-fir. The purpose of the Monarch Pass project is to reduce the extent of spruce beetle infestation, western balsam bark beetle infestation, improve forest resiliency to insect and disease infestations, improve watershed health and aquatic habitat, reduce fuel loading, protect infrastructure and developed sites (e.g., ski area, campgrounds, trail and highway corridors, power lines, etc. 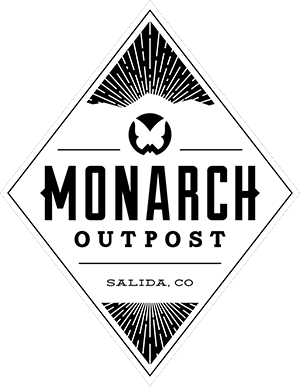 ), and provide for firefighter and public safety in the Monarch Pass area. The project has taken several years to develop and included public comment and environmental scoping under a Categorical Exclusion. It was authorized by the PSICC Supervisor’s Office in January of 2018. The timber crew has marked infested trees for the initial project phase and timber treatments are scheduled to begin in August of 2018. This will be a multi-year timber project and many updates will be provided as the project unfolds.